My uncle IS Santa Claus...as he'll tell you. He sells heavy machinery parts and equipment in the suburbs of Chicago, but to him it's not about playing a character; it's being Santa. My uncle IS Santa Claus...as he'll tell you. He sells heavy machinery parts and equipment in the suburbs of Chicago. He has a family...a loving wife (who plays Mrs. Claus) and two boys. When he was growing up his father WAS Santa Claus...for over 30 years. Ten years ago, the title was passed to my uncle. 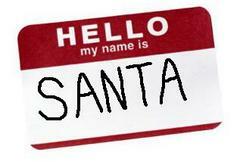 And, as he learned at Santa School, it's more than just "playing" Santa...it's BEING the character. Santa is a lifestyle. As we talk, he figures he hasn't shaved in 6 years. His beard, nearly 8 inches long at this point, is dyed white...his hair, dyed white, both quite preemptive to the natural progression of male graying. 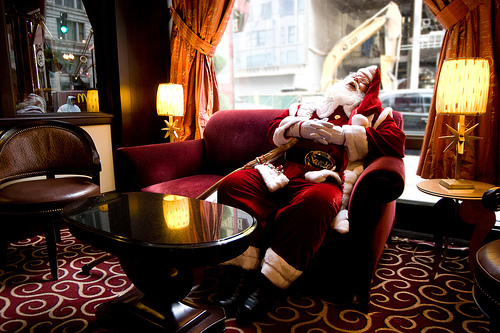 He is a middle-aged man living the life of Santa...in the suburbs of Chicago. Sometimes Santa needs a little help from the elves. 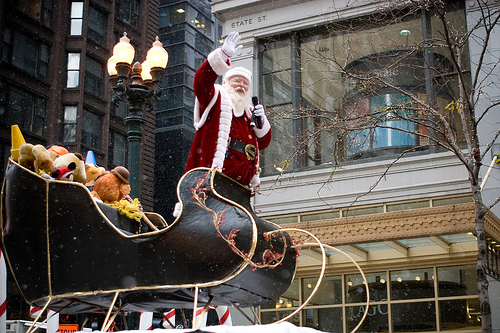 My uncle - Chicago's Santa Claus - finds inspiration in the memory of his father; Santa Claus.